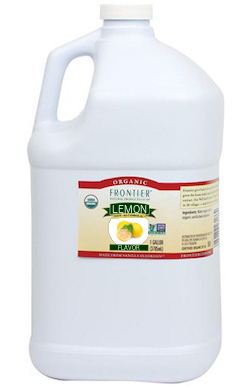 Frontier Natural Products Organic Lemon Flavoring 1 gal. Organic Lemon Flavor adds non-alcoholic, tart citrus flavor to your baked goods, smoothies, candies, frostings, sauces, sorbets, ice creams or teas. Our pure lemon flavor is stronger than lemon juice, so use in very small amounts. This item is not available for expedited shipping and must be shipped via ground service. This item is not available for expedited shipping and must be shipped via ground service. Ingredients: organic sunflower oil, lemon oil.